Explore the National Historic District of Cambria City. From about 1853 to 1910, thousands of immigrants settled in Cambria City, a neighborhood across the Conemaugh River from the Cambria Iron Works. They established ethnic social clubs, built ethnic churches and created a vibrant heritage that’s still celebrated today. Recognizing the uniqueness of this neighborhood, JAHA successfully submitted the area as a National Historic District in 1991. 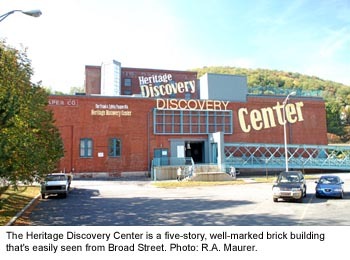 The Frank & Sylvia Pasquerilla Heritage Discovery Center, which is located in Cambria City and is #9 on this walking tour, opened in 2001 and explores the story of this historic neighborhood in depth. The population of the Cambria City neighborhood was once 11,000, but today is less than a thousand. Sadly, several of the Roman Catholic churches in Cambria City were closed in summer 2009, due to the declining population and a shortage of priests. Those churches marked with an asterisk (*) below are no longer active parishes. The former St. Stephen’s Slovak Roman Catholic Church has been renamed Resurrection Roman Catholic Church and is home to the merged parishes of Immaculate Conception, St. Columba’s, St. Rochus, Sts. Casimir & Emerich, and St. Stephen’s. However, on Jan. 25, 2012, a ceremony was held to transfer ownership of St. Columba, Sts. Casimir & Emerich, and Immaculate Conception to 1901 Church, Inc., a non-profit organization whose mission is to preserve and re-use these magnificent structures. This is a direct result of a November 2010 design charrette facilitated by JAHA and other organizations. On August 31, 2012, an event was held at the former Immaculate Conception to re-name and re-open it as Grand Halle, a reception and event facility. For more about the reuse effort, visit The Steeples Project online. To begin your walking tour of Cambria City, download and print this PDF map of the area. The tour begins at the end of Cambria City furthest away from downtown Johnstown, at the corner of Tenth Avenue and Broad Street. The corner of 10th Avenue and Broad Street. 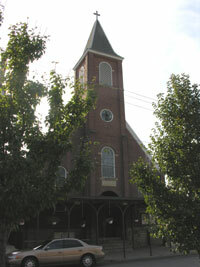 The St. Columba’s parish served the English-speaking residents of Cambria City, who were primarily Irish. 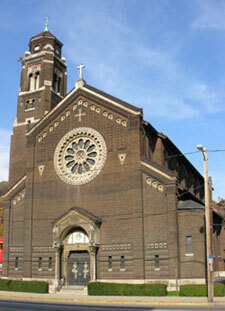 The current church building (pictured at left) was constructed in 1913-1914, designed by Pittsburgh architect John T. Comes, who also designed St. Mary’s. It is built in the Lombard Romanesque style and is distinguished by its four-story bell tower. 917 Chestnut Street. The first St. Columba’s church was constructed in 1888, and survived the 1889 flood — in fact, it served as a morgue in the immediate aftermath of the disaster. It is one of very few flood-surviving buildings left in Cambria City. 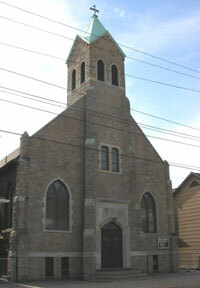 This first church building most recently served as the West End Catholic School and St. Columba’s activity center. Corner of 9th Ave. and Chestnut Street (902 Chestnut). German stonemason Albrecht Greiner arrived in Cambria City around 1882, and bought this lot for $900 in November 1889. His home was built shortly thereafter. Corner of 9th and Chestnut Streets. The congregation organized in 1896, and this church was built in 1902. 813 Chestnut St. John Wass, a German miner, built this house in 1891 and lived there with his wife, 5 children and at least one boarder. Three generations of the Wass family lived in the house until it was sold in 1938. Corner of 8th & Chestnut. This parish organized in 1894, and the church dates from 1908. 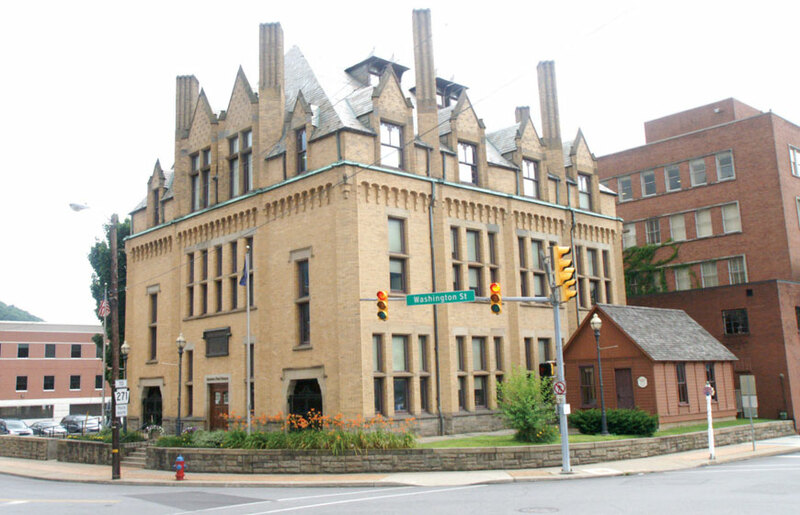 It also includes a school building and convent (“Hrvatska Skol Svroka”) built at 719 Chestnut in 1912-1913. Although this church was closed in 2009, its buildings are part of the new Resurrection parish. 410 8th Ave. This 1908 red brick building was a slaughterhouse and sausage factory that supplied August Mayer’s meat markets on Broad Street. Descendants of the Mayer family conveyed the building to St. Rochus in 1975, and most recently served as the church’s education center. 711 Chestnut Street. The congregation formed in 1914 and remodeled a house for use as a church and a school. The parishoners established a church building fund in 1921 and built the current church in 1932, keeping costs down by doing much of the construction work themselves. They conducted services in Slovak only until 1938, when services in both English and Slovak were offered. 8. Cambria Fire Hook & Ladder Co.
624 Broad Street. Built sometime after 1891, this building housed Cambria City’s first fire company, which was first organized in 1887 by German residents. 201 Sixth Ave. 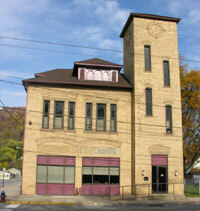 This 1907 brewery is today the Frank & Sylvia Pasquerilla Heritage Discovery Center, which tells the story of immigration to Johnstown around the turn of the century, focusing on the history of Cambria City. 601-601 1/2 Chestnut St., corner of 6th & Chestnut. John Casper Roth and his wife Elizabeth purchased this property in 1871, but it is unclear whether the house dates from the 1870s or the post-flood era. By 1895 they had added a second structure and rented it to boarders. 521 Power Street This double house was built by William Fehse, a mill laborer who also owned a store and restaurant on Chestnut Street. 500-511 Power St. Polish residents of Cambria City organized the St. Casimir’s parish in 1901, and construction of this church began the following year. Completion of the church was delayed until 1907 because of a mine accident in which more than 40 members of the church were killed. The Romanesque church was designed by Walter Myton. St. Emerich’s parish, which dates to 1905 and was founded by by Hungarian immigrants, merged with St. Casimir’s in the 1990s. 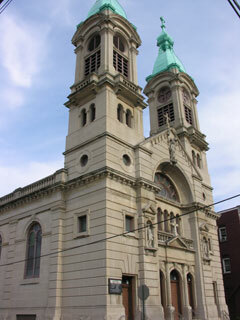 The St. Emerich’s church building (which stood at 600 Chestnut St.) was demolished in 2003. Corner of 5th & Broad. This ca. 1889 building operated as a public house and saloon through the early 1990s. 418 Broad Street. This 1865 house was built by German immigrant George and Frances Wagner, who became founding members of Immaculate Conception Church. 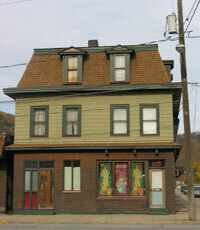 The Johnstown Area Heritage Association restored this house into a museum about immigrants’ lives at the turn of the century; the museum opened in 2006. The photo at right shows both the house, which survived the 1889 flood, and the new visitors center JAHA has constructed beside it. 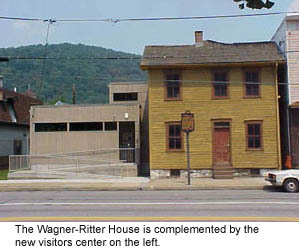 Visit the Wagner-Ritter House & Garden section of this site for much more about the house, the museum and the Wagner and Ritter families. 401-413 Power Street. St. Mary’s was founded by Ruthenians (Carpatho-Rusyn, or eastern Slavs), and first built a wooden church in 1895, a second church in 1900-1901, and this church in 1921-1922. 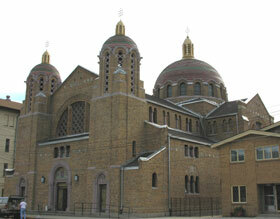 The church’s distinctive Byzantine features include its large central dome, elaborate brickwork and moorish windows. 306 Power Street. 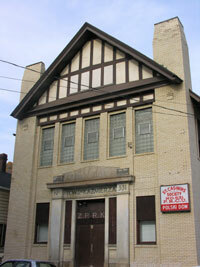 This 1915 clubhouse was built for the Polish St. Casimir’s Society. Architect Walter Myton planned the first floor to be used for “society rooms and club purposes,” while the second floor served as a ballroom. Corner of 4th and Chestnut Streets. 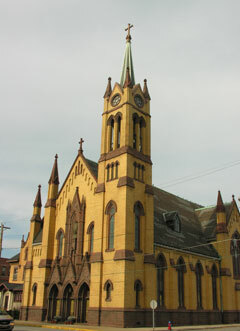 The parish was founded as St. Stephen’s Slovak Catholic Church in 1891, and the current church building was dedicated in 1911. Its twin, five-story bell towers flank the entrance, which faces Chestnut Street. In 2009, St. Stephen’s was renamed Resurrection Catholic Church, and is now home to the merged parishes of St. Emerich & Casimir, St. Columba, St. Rochus, Immaculate Conception, and St. Stephen’s. 411 Third Avenue. A former industrial building housing the Tulip Bottling Company, today the Bottle Works celebrates the area’s ethnicities by offering a variety of cultural programming, including exhibits, performances, workshops, cooking classes, films and lectures. 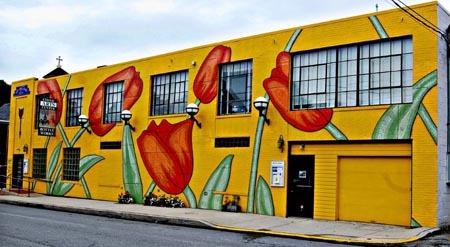 413 Third Avenue.– This former industrial building has been renovated with green techniques. Today the Art Works includes gallery space, artist workshops, and performance space. 314 Broad Street. Designed by Johnstown architect Walter Myton as an office building and meat market, this 1905 building was purchased in 1921 to be used as a hardware store. 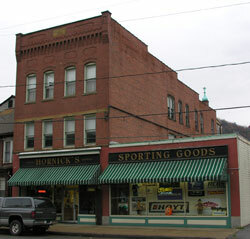 More recently it served as Hornick’s Sporting Goods, and the Hornick’s name is still on the facade. 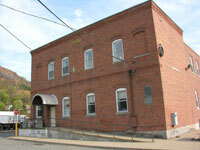 The Johnstown Concert Ballet recently moved into the building and plans to use it as their studio. Broad Street and 3rd Avenue. 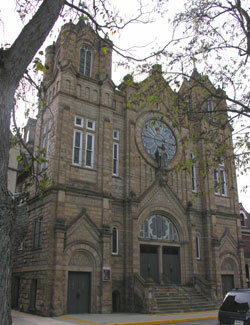 The *Immaculate Conception German Catholic parish was formed in 1859 and is the oldest parish in Cambria City. 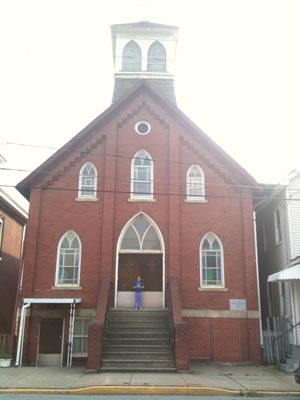 Its first church building was dedicated in 1859, and was reconstructed after the 1889 flood. The cornerstone for the current church was laid in 1906, while the rectory next to the church dates from 1890-1891. 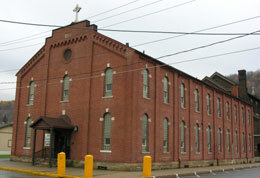 The church was vacant for several years after three Catholic churches in Cambria City were closed. In August 2012, the building was renamed and reopened as Grand Halle, and will be used as a special-event and reception venue. For more information on this project, visit The Steeples Project. 200-202 Broad Street. Originally constructed in 1890 as the 15th Ward Hotel , this property serves Cambria City as a public house/tavern, as it has done for more than 100 years. 317 Second Avenue. This white house was built between 1895 and 1900 by Matilda Pesch, who rented it to Hungarian laborer Michael Dubin, his family and their nine boarders. 324 Second Ave. These three-story brick buildings were constructed as rental properties by Victor Faith. One fronts onto Second Avenue, while the other (Rear 324) faces the mill across the river. 122 Chestnut Street. This red brick building with mansard roof was originally owned and operated as a grocery by Hungarian immigrants Victor and Etella Faith, and also served as the family’s residence. Later, it served the Faiths as a distillery, cigar factory, hotel, and steamship agency through which Cambria City residents could pass mail and money to the Old Country. 200-202 Chestnut Street. This ca. 1889 house is a double house built by George Lorditch and his wife Catherine, whose family worshipped at Immaculate Conception for many generations. Sources include: “Historic Cambria City: A Walking Tour Guide,” a JAHA publication by Jim Alexander; and “The Character of a Steel Mill City: Four Historic Neighborhoods of Johnstown, Pennsylvania,” published by the National Park Service for the America’s Industrial Heritage Project. For much more information about Cambria City and its history, access the PDF download of the 1991 application JAHA completed to get Cambria City listed as a National Historic District.